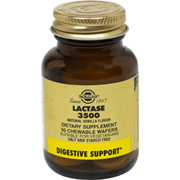 Lactase 3500 supplies the enzyme lactase that helps digest the lactose present in dairy foods. Solgar's Lactase 3500 Wafers are free of yeast, wheat, soy and dairy products and are formulated without the use of preservatives, artificial flavors or colors. † FCC Lactase Units are based on the U.S. Food Chemicals Codex. As a dietary supplement for adults, take one (1) wafer with, or just prior to, dairy food consumption, or as directed by a healthcare practitioner. Other Ingredients: Mannitol, Microcrystalline Cellulose, Guar Gum, Vegetable Magnesium Stearate, Natural Vanilla Flavor (powder). 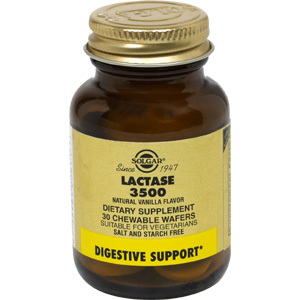 Lactase 3500 is shipped in a discrete, unmarked package. Orders are processed immediately and usually take about 3 to 5 working days to be received. We do ask that you try it for 2 to 3 weeks to feel the full effects. Any information received is used only for order processing and shipping purposes. Your information, such as e-mail address, will never be disclosed to a third party.